Soak it. Drop it*. Bury it. The Riptide is up for your toughest challenges. 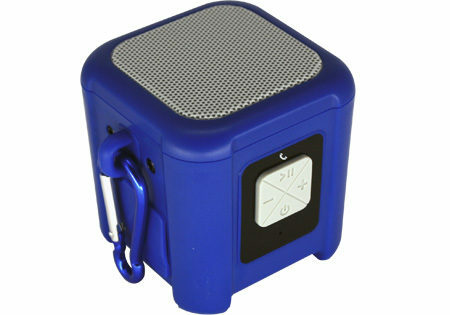 Tiny but powerful, this Bluetooth-enabled speaker is designed for those who travel light and journey far. Clip it to your knapsack with its built-in carabiner loop, or attach it to your kayak/dirtbike/hoverboard using its universal mount. Bring the beats wherever you go with the Riptide by NUU. Riptide is IP57 compliant, meaning it is waterproof, sand resistant, and can be submerged in water up to 3 feet deep for 30 minutes without complications. If wireless isn’t your thing, use the included 3.5 mm input cable. It can even work with your computer as a USB speaker! Riptide is a hugely versatile companion that will work with iOS, Android™, Windows, and Mac OS X devices in many ways. Stream your music for up to 6 hours with the Riptide's built-in rechargeable Li-ion battery. *Riptide drop testing meets or exceeds 1M drop test standards. * *Using the AUX-IN renders NUU speakers no longer waterproof or sand resistant.